Pictured: Adam Goodrum. Photography by Kevin Cheung. Creating a chair for the next generation of UTS students has been a career highlight for alum and award-winning industrial designer Adam Goodrum. It’s widely agreed: Adam Goodrum makes beautiful chairs. His ‘Stitch’ chair is sold around the world by famed Italian furniture brand Cappellini and his ‘Eve’ chair won him the prestigious Bombay Sapphire Design Discovery Award in 2005. Now the Perth-raised industrial designer is awaiting the unveiling of a chair he created for a very different space: the new UTS Reading Room. Set to open late this year, this scholarly space will bring the tradition of the world’s great universities to the UTS community and Ultimo precinct. Adam designed the one-of-a-kind chairs during his time as Artist in Residence for the new UTS Library in 2016. His brief was to create a chair for the new triple-height reading room – a space where people will come to read and reflect deeply on their area of study. Adam said it’s been a privilege to create a piece that will be used by UTS students like he was. That’s high praise from someone who has won a handful of global design awards and whose work sits in major museums such as the Philadelphia Museum of Art and the Design Museum Gent in Belgium. Here in Australia, his ‘Adam Goodrum by CULT’ furniture range with high-end design retailer CULT is proof that his design work stands with the best in the world. It’s been a steady path to success for the Lego-obsessed kid from Perth who grew up making tree houses, go-karts and surfboard trolleys. In high school, Adam loved art and thought about pursuing fine arts. Then he learnt of industrial design, where he could combine his eye for beauty with his flair for making things. At the age of 17, Adam jumped on the Indian-Pacific train from Perth to start an Industrial Design degree at UTS. Here he was influenced by Jim Montague, who schooled him in the history of design, and Carl Nielsen, a pioneer of industrial design in Australia. In third year, Adam created his first folding chair and realised that furniture design was his future. He started his own business as a side project as soon as he graduated, and won Sydney Morning Herald’s Young Designer of the Year award in 1997. Adam is humble about how quickly his career took off after that. Today, Adam works closely with a few clients to, “create functional objects with personality or a spirit.” He also shares his skills with UTS students as a mentor and part-time lecturer. Design trophies sit artfully in the colourful Waterloo studio that Adam shares with his graphic designer wife Michelle and their new Australian bulldog George. But Adam says his biggest professional thrill still comes from seeing people use the objects he’s created. Soon he’ll see the first students sit, read and reflect on the UTS Reading Room chair. You can make a gift towards the new UTS Library and Reading Room, so our students and community can enjoy these extraordinary learning spaces for generations to come. Support the library of the future here.. 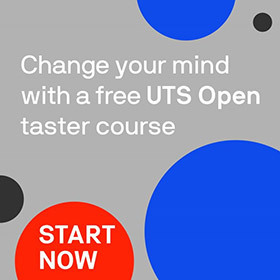 Whether you're upskilling or looking for a career change, take your career to the next level with a range of postgraduate courses at UTS. UTS alumni automatically save 10 per cent on our degree programs and short courses through the Alumni Advantage program.